Most years while ploughing the fields on his farm, Jean Luc Pamart will discover a body. A lost soldier. Thousands of French troops disappeared while defending the line on the banks of the Aisne in northern France during World War 1, and almost 100 years on their remains are still being uncovered. So too the explosives: hand grenades that resemble potatoes. Recently a local farmer disturbed a gas canister and was forced to abandon his tractor. These days the soldiers remains can be identified - such are the advances in DNA - and many of the bodies recovered are often returned to their families. But this battlefield, at Confrecourt, unlike the Somme to the north, is rarely visited. In the trees that border the sweet smelling meadows, there is a tangible link with the French army that served here. It is written and preserved in the darkness of medieval quarries. The walls in the caves are illuminated by the most extraordinary carvings and murals left by the frontline troops who sheltered there: regimental insignia; a roll call of the soldiers who had died; an altar where troops could pray before returning to battle. There is an artistry that belies the horror of the war that surrounded them. On one wall, there is an image of Marianne, as dear to French hearts as the vines and grapes they had chiselled on another. "Every year I dig up the past, the shells, even the soldiers' bodies," he said. "But nowhere is the battlefield and suffering as visible as it is here in the quarry." There are 500 such caves, many of them with murals. And yet they are not a regular part of the battlefield tour (though perhaps they would be, were they granted the Unesco status that is being considered). There is very little money from the French government. It is Mr Pamart that defends the quarries under lock and key - and for very good reason. "When I arrived here in 1980," he told me, "the caves were in a state of disarray. Many of the carvings had been hacked away." "Collectors were helping themselves to the sculptures. I worked to have the caves listed as a national heritage site. I put the barriers up to protect them. And yet there are still cases of vandalism," Mr Pamart said. 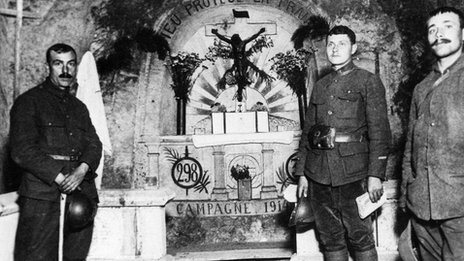 On one wall is an inscription to Sergeant Guitard, of the 417th infantry regiment, who died while on guard at the entrance to the cave. He was gassed. "The internet has made things much easier," Mr Pamart said. 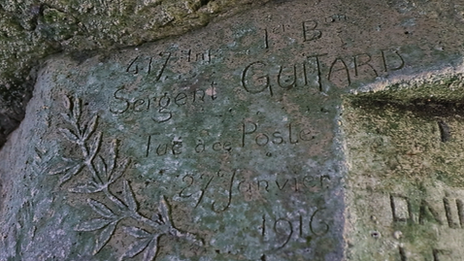 "Sergeant Guitard's family had no idea their grandfather had been commemorated on the wall - they only knew he had been buried close by. When they discovered where he had died, they cried - and I cried with them." "The soldiers would be down here for three days at a time. So close to the misery and desolation of the battlefields above, and yet they sculpted such magnificent things - and with such limited resources." They are not grandiose works of art. They are works of the heart, of pure emotion, produced in the most tragic circumstances. Some of them were drawn in pencil but were never finished. The caves were used initially as a hospital. But in the depths of winter, as the battlefield turned to mud, the walls were valuable shelter for the troops rotating from the front. By the altar they chiselled steps that lead through a tunnel to the trenches above. Looking through the narrow gap through which they squeezed, you can sense the fear, almost hear the guns that would shake the ground. The caves were also used to stable horses - much valued - and they kept German prisoners here too. Their shoes can still be found on the floor. So too the wooden batons that had pinned telegraph and electricity cables to the roof. The temperature inside the cave is constant and the limestone walls remain dry, which is why the murals are in such extraordinary condition. 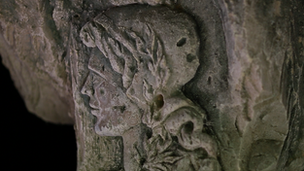 "A few of the carvings are signed, but that's very rare," Mr Pamart said. "Most of them are anonymous. But you often see names of villages, names of children and of wives left behind. Every soldier wanted to leave a trace of themselves." "To ensure that memory is preserved we are making duplicates of the carvings - we take photos, make plaster casts. We are currently funding a project to capture the sculptures electronically, so that they can be preserved and viewed in 3D." Of the more precious insignia, is one that honours the bravery of the 298th Infantry Regiment, awarded the Legion D'Honneur in 1914. But in November of that year, 19th company lost a position, in nearby Vingre, to the German advance. French commanders ordered that six of the soldiers who had retreated be chosen by lot and executed by their own men, as an example to the rest. Within a few years of the war, those six soldiers were posthumously pardoned (though no officer was punished) and today they are honoured in Vingre, alongside the last letters they wrote to their wives and children. These are the stories of the few that honour the many. And they are stories that should be preserved - and remembered - wherever they are found.